Kromski has three Saxony wheels of differing sizes with musical names. Their smallest is the Prelude the musical lead in, the Interlude for the short dramatic piece of instrumental music and their large classic spinning wheel the Symphony. All three wheels are the type of wheel that harkens a different era with medieval ladies in waiting gathering to spin. The Interlude, the medium size wheel, is a wonderful wheel for people who love the full visual impact of the Saxony style wheels but don’t have the room for a larger wheel. It gives a spinner the maximum spinning options while maintaining the classic style. The wheel is smaller and travels with more ease than the Symphony; however, with a 22 inch diameter the wheel allows for a wide range of ratios for different spinning fibers and styles. At 11 lbs the Interlude is the best Kromski Saxony style wheel that allows for travel to demonstrations, retreats, reenactment or guild meetings without losing the impact of such a classic style wheel, or smooth treadling. 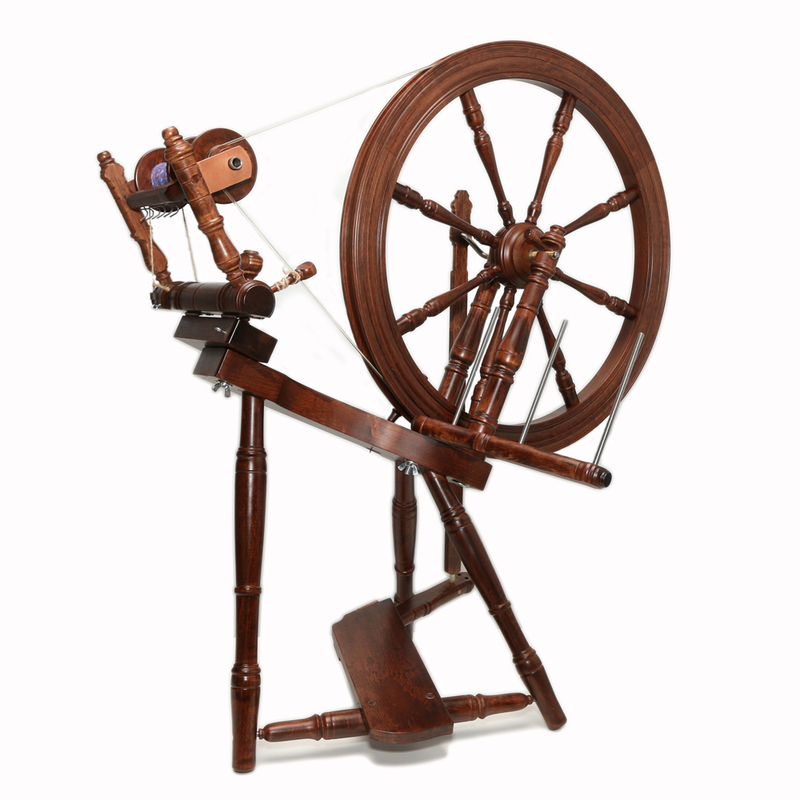 This is a great beginner wheel: Single drive, single treadle, easy assembly, yet the wheel offers enough different options that the seasoned spinner can enjoy sitting down to this wheel. The standard flyer offers ratios: 7, 13.5, and 15.5 to 1. If you’re looking for more options you can widen scope of your spinning with the use of the additional the Jumbo Flyer Kit and the Faster Flyer. The Interlude allows for different handling when spinning by changing the elevation of the drive bands. This is done by turning the drive band adjustment screw. You shouldn’t need tight tension between the flyer and wheel with the polyurethane drive band there is an even element to your treadling. Be careful when you are adjusting your drive band tensions, too much tension on the flyer will pull the wheel out of alignment making it harder to spin. The mother of all slides on the slots of the bench for the whole mother of all assembly. Kromski makes all of their bobbins to be interchangeable with any other of their wheels, including their double drive wheels. The bobbins can hold 4 oz or more of yarn depending on how you spin. • weight – 11 lbs. This wheel comes boxed as a kit but goes together quickly. It is available unfinished or with a factory clear, walnut or mahogany finish. Kromski flyer is held with leather maiden bearing that should be saturated with oil, without oil you will have drag and the leather will not last as long as it could with proper care. When you get your wheel soak the leather in 30 weight oil for a few hours to keep it soft and spinning freely. You’ll also have to regularly oil the spindle where the bobbin rides and on occasion add a little oil to the screw for adjusting drive band tension. The wheel can come off for long distance transport if you are worried about moving across the country. To do so remove the two screws on the far side of the wheel to the hub, pull out the wooden pegs the hold the wheel axle into the drive wheel support, slide off the brass bushing from the wheel axle. Previous articleField Trip! To Fiber First Inc.